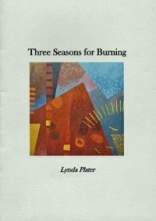 Three Seasons for Burning by Lynda Plater is a slightly melancholic and reflective chapbook of poems. It expresses both the author’s memories of deceased family members and a nostalgic yearning for a bygone era, when men worked the land with scythes and women knitted clothing for their fisherman husbands. Poetically the chapbook is filled with the potent symbolism of nature in the form of “owl”, “moon” and “sea”. The poems themselves work on many levels to convey these themes, due mainly to the author’s honest appraisal of her feelings towards her subject matter and the agile use of imagery and description. The first poem “Saving fruit” relates to her great-grandmother. Apples are “being laid out / for a later fruiting, gathering juice / as they sleep.” “They” refers to the author’s great grandparents who are described as “lying like fruit” – which is what her “great-grandmother did and spoke / soft to her man as he roused sheets / to lie beside her in the feather bed.” This is a simple poem and the evocative apple metaphor conveys an image of lasting love and intimacy, between the two subjects of this poem. Significantly, the author ends the second poem with “pale stars came out /over the flat fields / where corn and cane / ripened with fall.” By doing this she sets the tone of this chapbook, in which the actions and emotions of her subjects are often tied to nature and its cyclic patterns and seasonal characteristics. The poem “The Humber Light” describes a lighthouse for North Sea fishermen who “harbour in the arm-pit / of the Humber” and is an apt description which strongly recreates the time, work and place of these fishermen. “Harvestime” is a poignant piece which again connects the human world to the world of nature. The subject is the author’s brother and her memories of him. He was wounded by shrapnel at the battle of the Somme and the first line states “It is the last picture there is of him, / my brother in the sanatorium”. The poem continues “Hot metal small as seeds coursed / his pastoral as if his blood / were streams, his flesh, earth.” This metaphor expresses clearly and succinctly the recurring theme of man and his relation to nature, and it is an extremely vivid and lucid image. Three seasons for burning continues to use this theme of man and his natural surroundings to emphasise the author’s deep regard for those she has loved and lost. The poems also illustrate the concept, that though her subjects are no longer alive, they do still live in the body of nature and her consciousness. The most touching and personal poem is “My father made a mirror for a telescope”. Here nature is represented by “birds / on the water singing” as “It was the moment / of migration. / Flocks followed, / reflecting on other seasons.” And, with reference to her father, the author states “I loved my father’s face / though it was turned from me” and the last stanza is a testimony to her father in that “All the gods / were gathering / to the mirror / of his eye.” This powerful image reflects the love and adoration the author had for him and the poem is loaded with pathos. On reading this chapbook, I noted that two icons of nature were repeatedly mentioned. They were “moon” and “owl”: “the moon hangs”; “Moonrise weaves silver / through his arched wing” (of an owl); “The owl delivers up / moonlight / in his rising.”; “a pale owl before the line of trees”; “a tree with moon / mixed in winter fingers.” and “outside a moon winds / through blackthorn boughs, patterning the ground.” Evidently both these aspects of nature are extremely important for the author; but what they represent to her is not really made clear in the poems. I would suggest they are rather over-used in her poems and so lose their impact by the end of the book. Nevertheless, bar this one mild reservation, Three Seasons for Burning is a commendable, accessible and enjoyable chapbook in which Lynda Plater explores succinctly the recurring themes of love and loss and the connection of the cycles of nature with the cycles of the human condition.